Make: Wienermobile. Model: NPRHD. Year: 2012. This one’s name? OHIWISH. 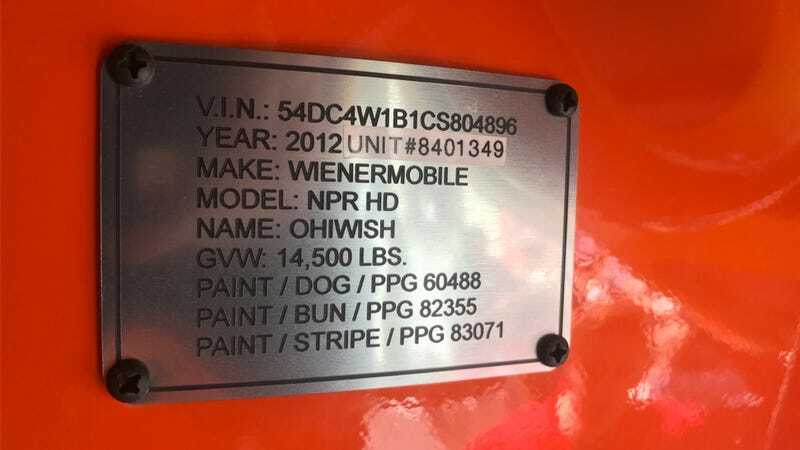 The Oscar Mayer Wienermobile randomly stopped outside our office today, and this is its VIN plate. A lot of the interesting things about the Wienermobile are immediately obvious – for one, it appears to resemble a giant hot dog. But this VIN plate, prominently displayed just inside the side hatch, is one of neater details. Not only does it have the actual vehicle identification number, but it’s also got little details like the gross vehicle weight and the exact colors used to paint it. Also, the license plate says “OHIWISH” as well. I’m sure it’s some #brand marketing thing, but I have no idea what it truly means and absolutely no desire to learn the definitive answer. What is the Wienermobile wishing for? Hot dogs? The open road? An alternative life as a city bus? Mysteries abound, but at least the one about the VIN plate is now solved. Oscar Mayer Wienermobile: Will It Baby?